Non-interventionist news portal Antiwar.com has accused Google of using “authoritarian” tactics and being “an arm of the US State Dept.,” after it stopped providing adverts on several of its stories, which the tech giant says violate its policy. “As Washington gets ready to re-invade Iraq, and in bombing, killing, and abusing more civilians, they suddenly decide that their ‘anti-violence’ policy, which prohibits ‘disturbing material’, prohibits any depiction of violence committed by the US government and paid for with your tax dollars,” said a statement from Antiwar.com, which urged its readers to lodge a protest against the Google policy. VIOLENCE/GORE: As stated in our program policies, AdSense publishers are not permitted to place Google ads on pages with violent or disturbing content, including sites with gory text or images. VIOLENCE: As stated in our program policies, AdSense publishers are not permitted to place Google ads on pages with violent content. This includes sites with content related to breaking bones, getting hit by trains or cars, or people receiving serious injuries. But Antiwar.com’s director of operations Angela Keaton told RT that the removal took place without the requisite 72-hour warning, and that even if there was a violation of the letter of the regulations, it was “equating news with titillation” and suppressing legitimate journalism. 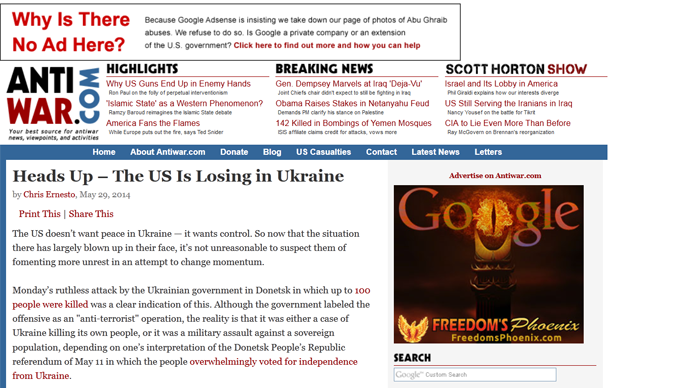 Google then reinstated AdSense – only for the conflict to flare up again. On Friday, the California giant wrote to Antiwar.com, saying that its article from May last year, which showed an AP photo of Ukrainian rebels killed by government forces, also violated its policies. 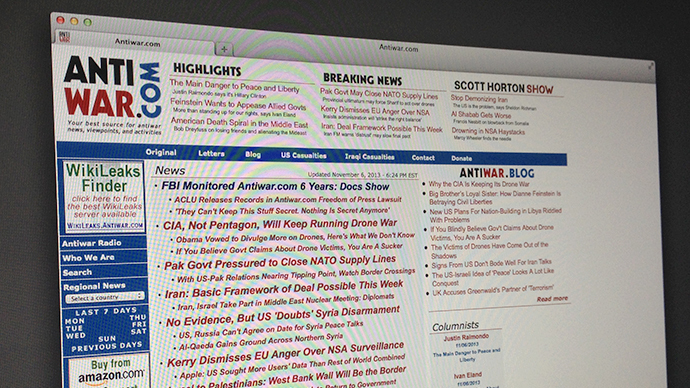 As opposed to playing “whack-a-mole,” scanning each article for potential violations, Antiwar.com has now decided to break off its contract with Google altogether. “Antiwar.com has no intention of allowing Google to dictate our content. We are looking into alternate sources of advertising and will not likely be working with Google AdSense in the future,” said a letter from the editorial team.